﻿ ALL ENGLAND 2018 Finals – And history was made! ALL ENGLAND 2018 Finals – And history was made! Japan and Denmark both re-wrote history today as Yuta Watanabe and Arisa Higashino became the first Japanese to win the All England mixed doubles title while Denmark grabbed their first women’s doubles title since 1967 thanks to Kamilla Rytter Juhl and Christinna Pedersen. Yuta Watanabe and Arisa Higashino (pictured left) sealed their name into the All England Championships history by becoming the first ever Japanese pair to win the mixed doubles crown after a superb final over China’s Huang Yaqiong and Zheng Siwei. Despite a very hesitant first game where they lost 15-21, the Japanese duo returned much more consistent in the second set, with a very agile game. “We were not really aggressive in the first game and in the second we managed to calm our nerves which helped me to return better shots and for Yuta to have better attacks,” analysed Arisa Higashino after her win. A very tight second game, won 22-20, the pair exploded with confidence all over the set. The youngster Higashino even showed on many occasions her tremendous jump smashes, that cost Zheng Siwei and Huang Yaqiong several points. The pair finally signed their deal 21-16, to be forever marked on the All England Championships history. “We are obviously happy to make history here but we don’t want to be satisfied with that. We would like to come back next year and win again!” concluded the delighted Arisa Higashino. 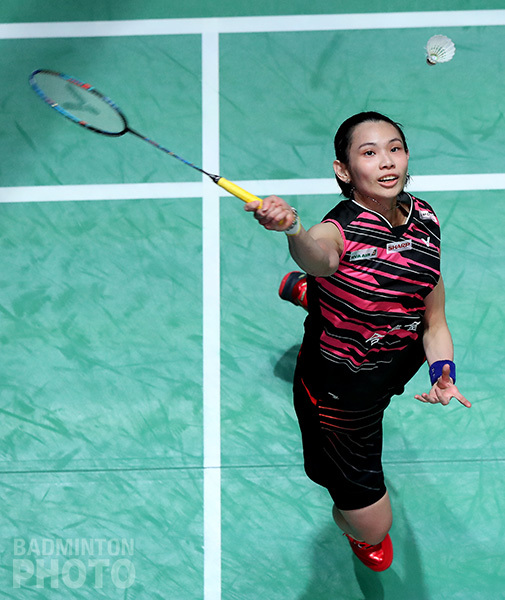 World #1 and tournament favourite Tai Tzu Ying (pictured right) defended her title in Birmingham, beating Akane Yamaguchi, 22-20, 21-13. Yamaguchi was first to reach game point in the first game. However, the reigning champion kept her composure and proved why she is the world’s best. “When the score was 19-20 (to Yamaguchi) I told myself not to give up or given in and not lose the match like this. I managed to come back so it was good,” said Tai. After a close first game, Yamaguchi simply was not able to match Tai’s speed and precision, succumbing to an 8-point deficit in the second game. “Today she gave me a hard time because I was chasing her all the time, so I was never leading the game and there weren’t many opportunities for me to lead the game,” said Yamaguchi. At the end of the afternoon, the “Minions” launched the latest scene to show why they are on top of the world chart. They edged Denmark’s Carsten Mogensen and Mathias Boe who, in spite of some great defense were unable to keep up with the incredible pace by the Indonesians Marcus Fernaldi Gideon / Kevin Sanjaya Sukamuljo (pictured left). The diminutive duo displayed the length of their talent as they beat their elder – and taller – opponents 21-18, 21-17 in a rivalry that has had half of its installments so far occur in tournament finals. Shi Yuqi (pictured right) upgraded his silver medal from last year and became All England men’s singles champion. Shi beat his compatriot and badminton legend Lin Dan in hard-fought three games, 21-19, 16-21, 21-9. The youngster prevented his legendary teammate Lin Dan from taking a 7th title, in an All England title resume that began before the Superseries came into existence. “I feel really happy to have won the All England Open Championships for the Chinese national team like Lin Dan and Chen Long. I just feel so happy I have completed this achievement,” said Shi afterward. 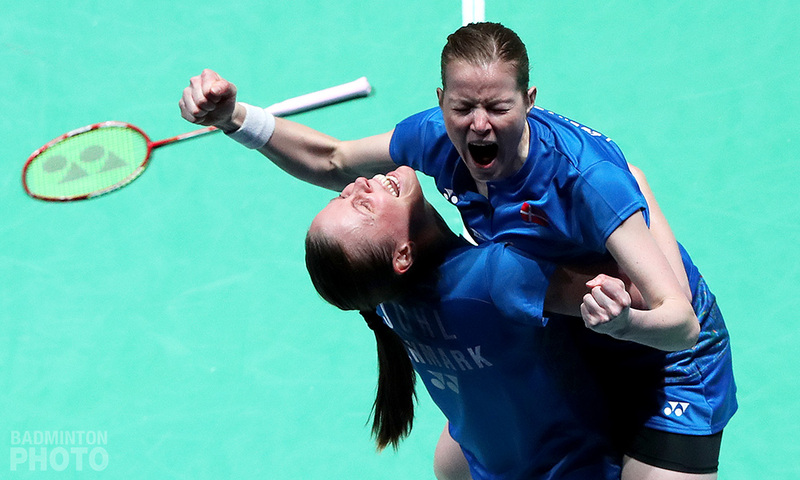 Kamilla Rytter Juhl / Christinna Pedersen (pictured bottom) also made great use of their second consecutive All England final. They were crowned the women’s doubles champions after beating the 4th-seeded pair from Japan Yuki Fukushima / Sayaka Hirota in straight games, 21-19, 21-18 to become the first all-Danish duo to win the title since 1965. Their compatriot Ulla Strand did return for another women’s title in ’67 with Dutch partner Imre Rietveld. Rytter Juhl / Pedersen’s relentless attacks slowly chipped away their opponents’ solid defence. In an impressive display of power and speed, the world #3 roared to victory at Arena Birmingham, though only after an equally commendable performance from Fukushima / Hirota.